Early In Nikola Tesla's Researches--In Fact as Far Back as 1892--He Discovered a Most Peculiar and Wonderful Vacuum Bulb Phenomena. 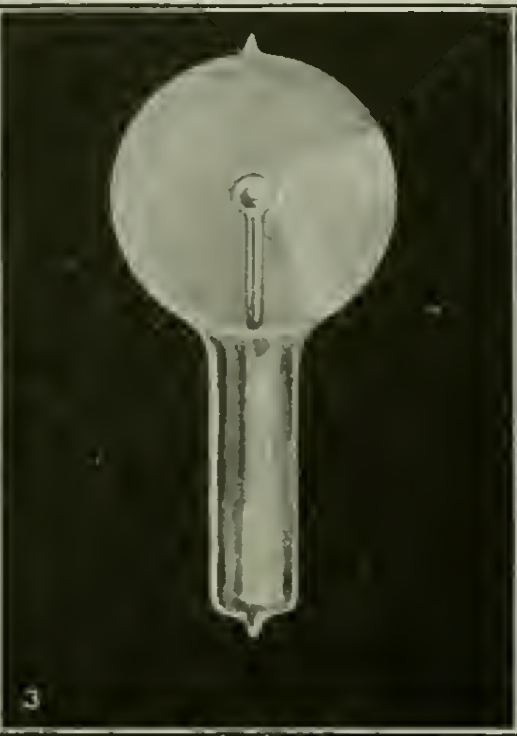 The Effect was That, Under Certain Critical Conditions, This Bulb Would Cause a Ray to Be Shot off in the Manner Shown, Which Ray Would Revolve or Oscillate Under the Influence of a High-Frequency Current and in Synchrony with it. By Utilizing This Principle, Dr. Tesla Believes it is Possible to Produce a Radio Detector More Sensitive Than the Audion or Fleming Valve. In the May issue in his article, "True Wireless," Nikola Tesla mentions the forerunner of the Audion, a Vacuum Bulb, which he used in his earlier experiments. We have been in receipt of numerous letters from many individuals interested in this bulb who desire further particulars as to its operation, etc. Accordingly, we publish herewith some excerpts from a lecture by Dr. Tesla delivered before the Institution of Electrical Engineers and Royal Institution, London, February, 1892. "I think it best at this juncture to bring before you a phenomenon, observed by me some time ago, which to the purely scientific investigator may perhaps appear more interesting than any of the results which I have the privilege to present to you this evening. "It may be quite properly ranked among the brush phenomena--in fact, it is a brush, formed at, or near, a single terminal in high vacuum. "In bulbs provided with a conducting terminal, tho it be of aluminum, the brush has but an ephemeral existence, and cannot, unfortunately, be indefinitely preserved in its most sensitive state, even in a bulb devoid of any conducting electrode. In studying the phenomenon, by all means a bulb having no leading-in wire should be used. I have found it best to use bulbs constructed as indicated in Figs. 1 and 2. "In Fig. 1 the bulb comprises an incandescent lamp globe L, in the neck of which is sealed a barometer tube b, the end of which is blown out to form a small sphere s. This sphere should be sealed as closely as possible in the center of the large globe. Before sealing, a thin tube t, of aluminum sheet, may be slipt in the barometer tube, but it is not important to employ it. "The small hollow sphere s is filled with some conducting powder, and a wire w is cemented in the neck for the purpose of connecting the conducting powder with the generator. "The construction shown in Fig. 2 was chosen in order to remove from the brush any conducting body which might possibly affect it. 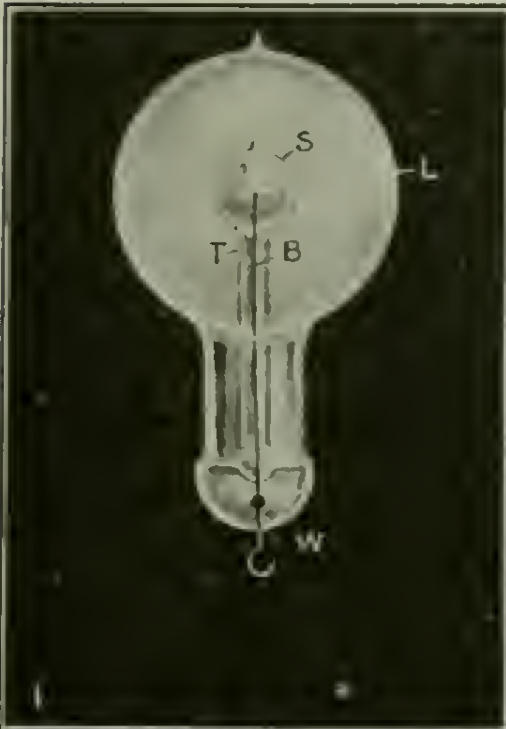 The bulb consists in this case of a lamp globe L, which has a neck n, provided with a tube b and small sphere s, sealed to it, so that two entirely independent compartments are formed, as indicated in the drawing. When the bulb is in use the neck n is provided with a tinfoil coating, which is connected to the generator and acts inductively upon the moderately rarefied and highly conducting gas inclosed in the neck. From there the current passes thru the tube b into the small sphere s, to act by induction upon the gas contained in the globe L.
"It is of advantage to make the tube t very thick, the hole thru it very small, and to blow the sphere s very thin. It is of the greatest importance that the sphere s be placed in the center of the globe L.
"When the globe L (Figs. 1 and 2) is exhausted to a very high degree, generally the bulb is not excited upon connecting the wire w (Fig. 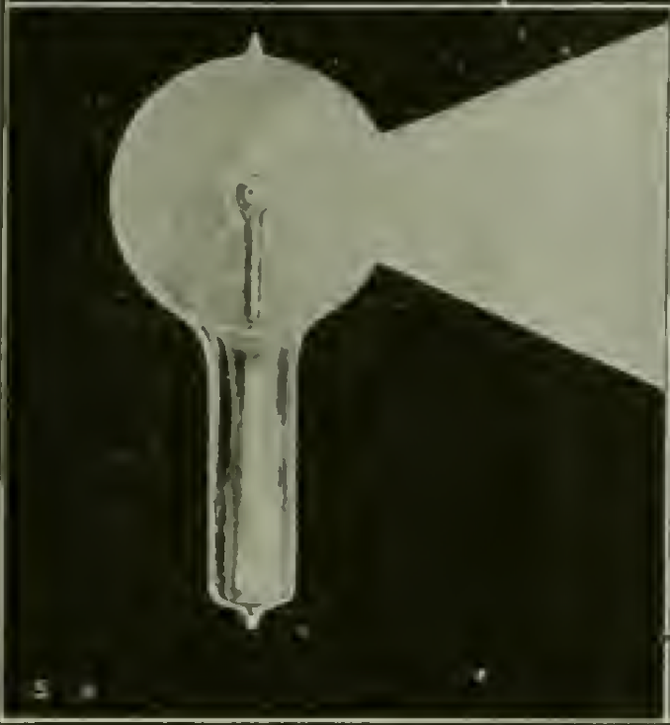 1), or the tinfoil coating of the bulb (Fig. 2) to the terminal of the induction coil. To excite it, it is usually sufficient to grasp the globe L with the hand. An intense phosphorescence then spreads at first over the globe, but soon gives place to a white, misty light. Shortly afterward one may notice that the luminosity is unevenly distributed in the globe, and after passing the current for some time the bulb appears as in Fig. 4. From this stage the phenomenon will gradually pass to that indicated in Fig. 5, after some minutes, hours, days or weeks, according as the bulb is worked. Warming the bulb or increasing the potential hastens the transit. "When the brush assumes the form indicated in Fig. 5, it may be brought to a state of extreme sensitiveness to electrostatic and magnetic influence. The bulb hanging straight down from a wire, and all objects being remote from it, the approach of the observer at a few paces from the bulb will cause the brush to fly to the opposite side, and if he walks around the bulb it will always keep on the opposite side. It may begin to spin around the terminal long before it reaches the sensitive stage. When it begins to turn around, principally, but also before, it is affected by a magnet, and at a certain stage it is susceptible to magnetic influence to an astonishing degree. A small permanent magnet, with its poles at a distance of no more than two centimeters, will affect it visibly at a distance of two meters, slowing down or accelerating the rotation according to how it is held relatively to the brush. I think I have observed that at the stage when it is most sensitive to magnetic, it is not most sensitive to electrostatic, influence. "When the bulb hangs with the globe L down, the rotation is always clockwise. In the southern hemisphere it would occur in the opposite direction, and on the equator the brush should not turn at all. The rotation may be reversed by a magnet kept at some distance. The brush rotates best, seemingly, when it is at right angles to the lines of force of the earth. It very likely rotates, when at its maximum speed, in synchronism with the alternations, say, 10,000 times a second. The rotation can be slowed down or accelerated by the approach or receding of the observer, or any conducting body, but it cannot be reversed by putting the bulb in any position. When it is in the state of the highest sensitiveness and the potential or frequency be varied, the sensitiveness is rapidly diminished. Changing either of these but little will generally stop the rotation. The sensitiveness is likewise affected by the variations of temperature. To attain great sensitiveness it is necessary to have the small sphere s in the center of the globe L, as otherwise the electrostatic action of the glass of the globe will tend to stop the rotation. The sphere s should be small and of uniform thickness; any dissymetry of course has the effect to diminish the sensitiveness. "The fact that the brush rotates in a definite direction in a permanent magnetic field seems to show that in alternating currents of very high frequency the positive and negative impulses are not equal, but that one always preponderates over the other. "Of course, this rotation in one direction may be due to the action of the two elements of the same current upon each other, or to the action of the field produced by one of the elements upon the other, as in a series motor, without necessarily one impulse being stronger than the other. The fact that the brush turns, as far as I could observe, in any position, would account for this theory. In such case it would turn at any point of the earth's surface. but, on the other hand, it is then hard to explain why a permanent magnet should reverse the rotation, and one must assume the preponderance of impulses of one kind. "As to the causes of the formation of the brush or stream, I think it is due to the electrostatic action of the globe and the dissymetry of the parts. If the small bulb s and the globe L were perfect concentric spheres, and the glass thru out of the same thickness and quality, I think the brush would not form, as the tendency to pass would be equal on all sides. That the formation of the stream is due to an irregularity is apparent from the fact that it has the tendency to remain in one position, and rotation occurs most generally only when it is brought out of this position by electrostatic or magnetic influence. When in an extremely sensitive state it rests in one position, and most curious experiments may be performed with it. 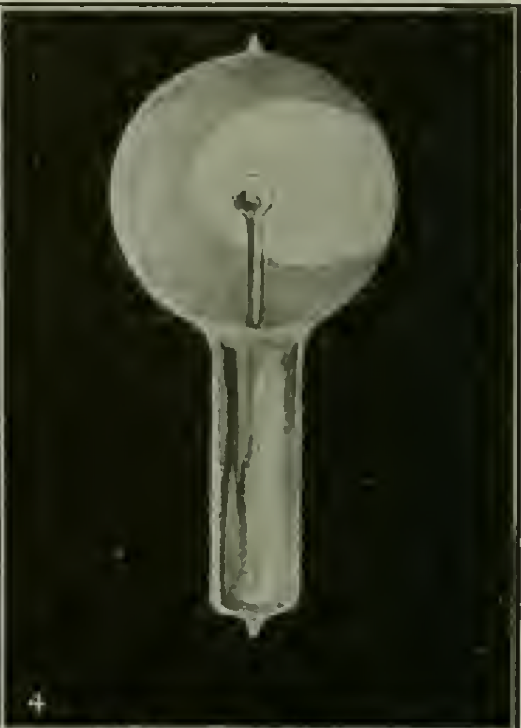 For instance, the experimenter may, by selecting a proper position, approach the hand at a certain considerable distance to the bulb, and he may cause the brush to pass off by merely stiffening the muscles of the arm. When it begins to rotate slowly, and the hands are held at a proper distance, it is impossible to make even the slightest motion without producing a visible effect upon the brush. A metal plate connected to the other terminal of the coil affects it at a great distance, slowing down the rotation often to one turn a second. "I am firmly convinced that such a brush, when we learn how to produce it properly, will prove a valuable aid in the investigation of the nature of the forces acting in an electrostatic or magnetic field. If there is any motion which is measurable going on in the space, such a brush ought to reveal it. It is, so to speak, a beam of light--frictionless, devoid of inertia. "I think that it may find practical applications in telegraphy. With such a brush it would be possible to send dispatches across the Atlantic, for instance, with any speed, since its sensitiveness may be so great that the slightest changes will affect it. If it were possible to make the stream more intense and very narrow, its deflections could be easily photographed. "I have been interested to find whether there is a rotation of the stream itself, or whether there is simply a stress traveling around the bulb. For this purpose I mounted a light mica fan so that its vanes were in the path of the brush. If the stream itself was rotating the fan would be spun around. I could produce no distinct rotation of the fan, altho I tried the experiment repeatedly; but as the fan exerted a noticeable influence on the stream, and the apparent rotation of the latter was, in this case, never quite satisfactory, the experiment did not appear to be conclusive. "I have been unable to produce the phenomenon with the disruptive discharge coil, altho every other form of these phenomena can be well produced by it--many, in fact, much better than with coils operated from an alternator. "It may be possible to produce the brush by impulses of one direction, or even by a steady potential, in which case it would be still more sensitive to magnetic influence." Fig. 6 shows a practical application of the Tesla bulb. 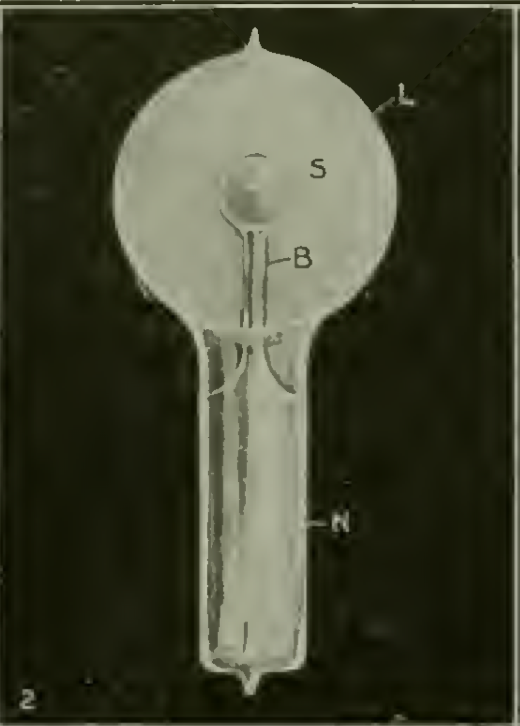 The bulb itself, as will be seen, is excited by means of a Tesla high frequency alternator which, in turn, is connected to the primary of a transformer. The secondary of the transformer is grounded at one end, while the other end of the transformer connects with the Tesla bulb. 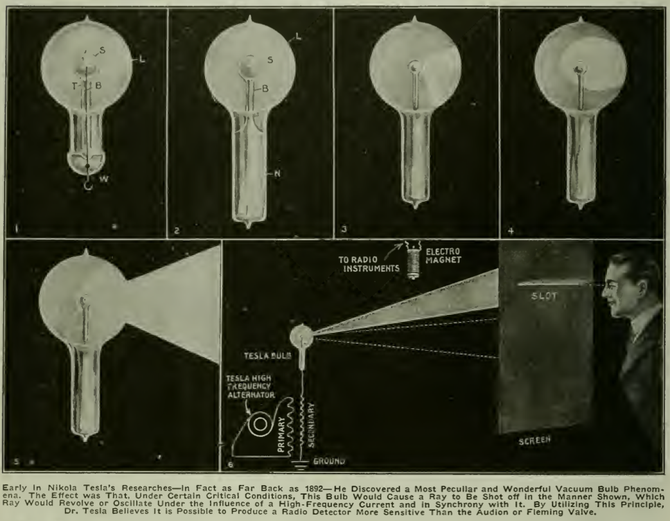 Dr. Tesla, in an interview, stated that the best way to use the bulb for such experiments is when the shaft of light is in the position as shown in Figs. 5 and 6, at rest, but in a state of equilibrium inconceivably delicate. This is fully described above in Dr. Tesla's lecture. The inventor states that in such a condition, the shaft of light is marvelously sensitive to magnetic disturbances. Dr. Tesla informs us that a toy permanent horseshoe magnet not longer than 1/2" and with its poles 1/8" apart could with ease throw the shaft of light out of its normal direction across the whole room. 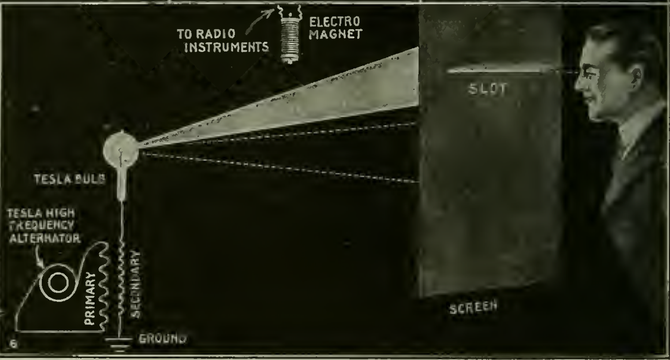 In our illustration, an electromagnet is shown a few inches away from light ray, and we can imagine a slot in a screen in such a way that normally no light falls thru it. If, however, very faint radio-telegraphic impulses surge thru the electromagnet, the light ray will immediately become displaced, and will fall into the slot. Inasmuch as this shaft of light has no inertia, it will follow exactly the dot and dash impulses surging thru the electromagnet, no matter how rapidly they take place. They can then either be read off by the eye, or if desired, can be registered upon a fast moving film. This method will, of course, only be used where the transmission is made at high speed, and where it would be impossible for an operator at the receiving end to follow the dots and dashes with the eye. The method shown by us in Fig. 6, of course, represents only one. Many others can undoubtedly be evolved to use the Tesla bulb to advantage.